The most important words today, are the words of our Wet’suwet’en brothers and sisters, who in a time of need speak up, and defend the truths of our forefathers. Don’t let this time pass, with silence on your lips. Shirley wilson on Smogelgem Revisited – Who is the legitimate heir? If you were searching before and now cannot find what you are looking for, use a key word your sure is in the article. We are changing the layout and replacing all our categories and tags (keywords) We are trying to reduce keywords to increase the accuracy of search. Are you supporting aboriginal rights that deny other aboriginals of their rights? The Unist’ot’en anarchists would have you believe it’s their land they defend, when the truth is the Carrier Sekani Tribal Council also claim the same land. Are you being duped into sending anarchists support and cash? The anarchists and their Chiefs represent less that 15% of the Wet’suwet’en people. Learn more, read and challenge your knowledge of the facts, or, challenge them to prove their claims, as opposed to taking their word for it. We might not get our message out there as fast as mainstream media, but over time the world will see that there are two sides to every coin, and that the pen is mightier than the sword. We will make a difference to those who seek out the truth. For very one person that reads what we have to say, they can influence many around them. Jan 3rd 2016 – but this website has been on line since 2002. The problem with the accuracy of flag counter is that many ad blocker programs prevent counts from external counters. We know we lose some of our count that way, but that’s ok, it’s all in fun. ….. and the good part is that we cannot manipulate the count, so what your seeing really did happen. Before you comment, be aware that we will not tolerate any disrespect towards our local aboriginal brothers, sisters and neighbors. They should not bear the cross for what anarchist aboriginals are doing. They cause us all hurt and grief so be respectful in regards to our innocent neighbors. On the issue of blockades in the Houston BC area, we will only allow comments from people living in the Bulkley Valley or by Wet’suwet’en members, if we can confirm they are such. If your living on the pipeline path outside of our area, we will consider your comments, and post them if we feel they are appropriate. Smogelgem Revisited – Who is the legitimate heir? Wet’suwet’en Hereditary Chief Wi’hali’yte speaks out. Moricetown Chiefs do not represent Wet’suwet’en clans and houses. 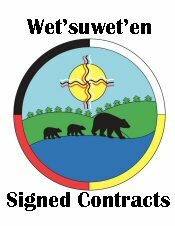 The Office of the Wet’suwet’en operate under the false guise of Wet’suwet’en Law. Going out trapping is like a form of healing cause it takes out people out on the territory, and it gives them the opportunity to do the same thing their ancestors did. Gidimt’en reoccupied the space where Wet’suwet’en have lived and gathered, to engage in sustainable practices on the land for generations. All fossil fuels are bad for the environment, we need to stop producing it. The court affirmed that the Wet’suwet’en have never ceded or surrendered their title to 22,000 square kilometers of land in northern B.C. The endangered White Bark Pine growing in Tsayu territory. The Unist’ot’en were the only ones who continually defended their land in order to protect it. There is sacred moose and grizzly sanctuaries up in the Morice watershed, and no industry has been up in there yet. The system of governance by the Wet’suwet’en has been around for thousands of years. The sacred water of the Morice River, you can drink it safely unlike anywhere else. 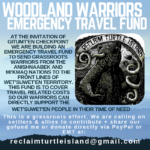 Wet’suwet’en are asserting their right to protect their lands also known as unceded territory. Office of Wet’suwet’en – Blockades on the horizon?